Nothing has changed the real estate industry more than the continuous growth and the role of technology and the explosion of the Internet, Mobile, Social, Video and more being used by both real estate practitioners and consumers. With today's consumer having access to more information and tools than ever before, their needs and expectations have evolved and they are demanding more knowledge and service from their REALTOR than ever before. 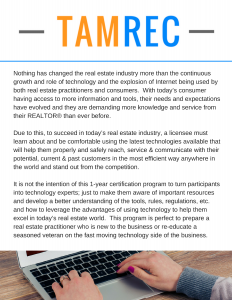 Due to this, to succeed in today's real estate industry, a licensee must learn about and be comfortable using the latest technologies and marketing techniques available that will help them properly and safely reach, service and communicate with their potential, current and past customers in the most efficient way and stand out from the competition. 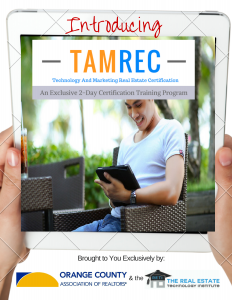 It is not the intention of this 1-year certification program to turn participants into technology or marketing experts; just to make them aware of important resources and develop a better understanding of the tools, regulations, etc and how to leverage the advantages of using technology to help them excel in today's real estate world. This program is perfect to prepare a real estate practitioner who is new to the business or re-educate a seasoned veteran on the fast moving technology side of the business. 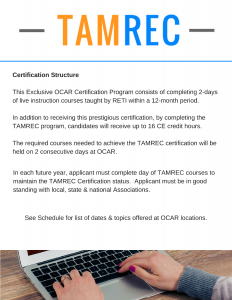 This Exclusive TAMREC Certification Program consists of completing 2-days of live instruction courses taught by RETI within a 12-monty period. In addition to receiving this prestigious certification, by completing the TAMREC program, candidates will receive up to 16 CE credit hours. This required courses needed to achieve the TAMREC certification will be held on 2 consecutive days at TAMREC Partner locations. Applicant must be in good standing with local, state & national Associations. Can i get more info on this course? What would we need to do to get this training in the Johnson City area? I think it would be a great class. I would love to take it. If not offer it online for agents to get the certification. Thanks!! Basically all that would needed to be done is for your local association, company or organization to book me to come and teach the 2-day program in your area. I do work in TN a couple of times a year (in fact I just did an event in Knoxville a couple of weeks ago and will be back again in Williamson County for a CRS course at the end of November. Are you a part of an association or company that might be interested in booking it and want me to send you additional info or do you want to connect me with someone who would make these decisions? Let me know your thoughts and any questions you may have.